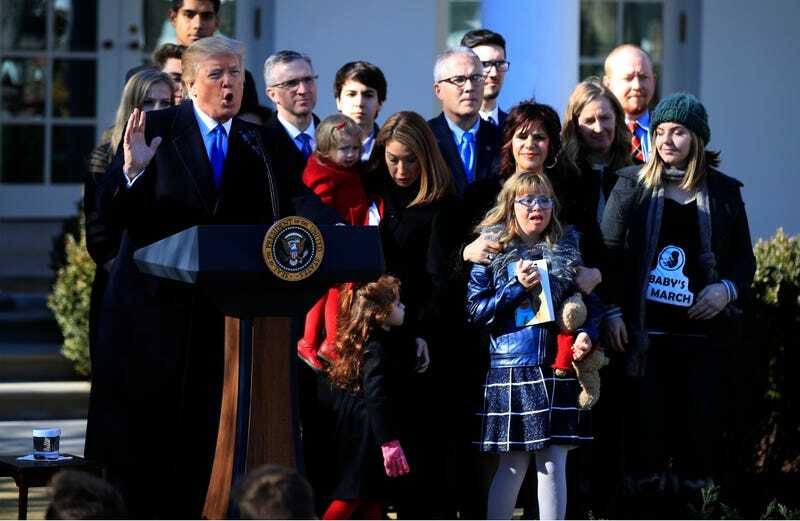 Donald Trump speaks to anti-abortion supporters last year at a March for Life event at the White House. In a decision sure to further shore up support among his pro-life base, Donald Trump is set to screen the controversial anti-abortion film Gosnell at the White House Friday. The crowdfunded film that chronicles the trial and conviction of Philadelphia abortion doctor Kermit Gosnell will be shown by invitation to a group of pro-life activists and others, Slate reports. The Gosnell case inflamed both sides of the abortion debate when news broke six years ago about the abysmal conditions inside the Women’s Medical Society clinic he ran in Philadelphia serving many black, brown and immigrant women. A 41-year-old woman, Karnamaya Mongar of Virginia, died of a drug overdose while undergoing an abortion at the clinic, which authorities described as a filthy “house of horrors,” with unsanitary equipment, poorly trained staff, and where investigators found glass jars holding dismembered remains of fetuses. The details of the case that went to trial were gruesome, with Gosnell being found guilty of murder in the deaths of three babies whose spinal cords were snipped after they were born alive during botched abortions at the clinic. Gosnell is serving a sentence of life without the possibility of parole. But while many in the pro-life movement have jumped on the Gosnell case as proof that a woman’s right to have an abortion needs to end, many who are pro-choice say the Gosnell case proves the need for women to have easy access to safe, legal abortions, with restrictions often leading women to clinics like Gosnell’s. Abortion rights activists explained repeatedly throughout the Gosnell trial in 2013 that Kermit Gosnell was exactly what women resort to when abortion becomes too hard to obtain. Now, with the Gosnell movie launching a limited theater release and Brett Kavanaugh now seated as the newest Supreme Court justice, we are at a cross roads in abortion rights .... Because when you make abortion completely inaccessible — either legally or financially — there will always be someone around to take advantage of the vulnerable women left behind. U.S. presidents throughout history have often screened movies, especially ones of political or cultural importance, like Selma and Hidden Figures at the Obama White House. But because White House screenings are at least a tacit presidential endorsement of a film, they have also engendered controversy. Among the most notable: the first White House film screening, in 1915 for the Ku Klux Klan fan favorite D.W. Griffith’s Birth of a Nation. The then-nascent NAACP protested President Woodrow Wilson’s decision to host a showing of a film that depicted African Americans as ignorant, degenerate rapists of white women and heralded the rise of the KKK. With growing debate over the safety Roe v. Wade in the era of an increasingly conservative Supreme Court, the showing of Gosnell at the White House may engender similar concern.